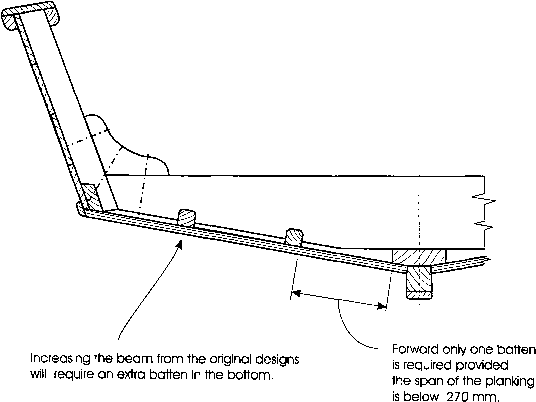 The beam of the various boats can be modified on the basis of the frame dimensions given in pages 6 to 10. The maximum increase in the beam is 20 % which means that the moulded beam increase from 1.85 m to 2.20 m.
As an example how this is done is taken the frames from midship and forward. Start with the widest frame and multiply the half beam with the chosen factor of increase, in this case = 1.2. Draw a line parallel with the base line and mark off the new beam. From this new sheerpoint, draw a line parallel with the old sideframe and transfer the length of the sideframe = B and mark off the new chlnepoint. Draw the new bottom frame. Draw a line at right angle to the side -frame through the old sheerpoint, Measure the distance C from the new sheerpoint down to this line. 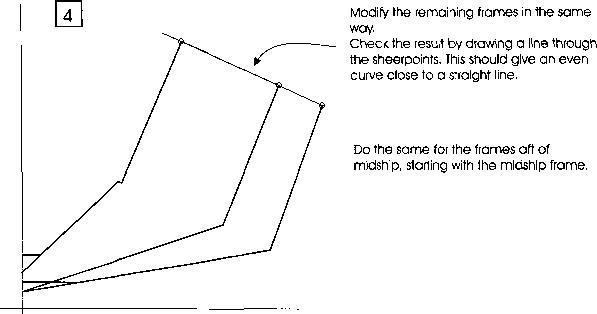 On the next frame, draw a line through the sheerpoint and at right angle to the sideframe. Draw a parallel line at a distance = C.
Transfer the length of the old sideframe = E to the new sideframe in the same way as done for the midship frame, From the new chinepoint draw the new bottomframe. Heavier timber is usually more rot resistant than lighter timber and this is important in parts of the boat that are difficult to change such as frames, keel and the stem. Through experience, boatbuilders have been able to determine which local timber is suitable for these items and it is safest to follow their advice. The more known timbers of type A are oak, iroko, kapur, afromosia, opepe, gurjun and teak, but there are many other species that might be known locally as suitable. A timber of relatively light weight of between 500 kg / m to 600 kg / m3when air-dried. The timber is mainly used for planking and deck, and the most important quality is low movement in service, that it does not swell or shrink much with changing humidity. Known timber suitable for this is mahogany, Douglas fir and European redwood, but there are many other species. 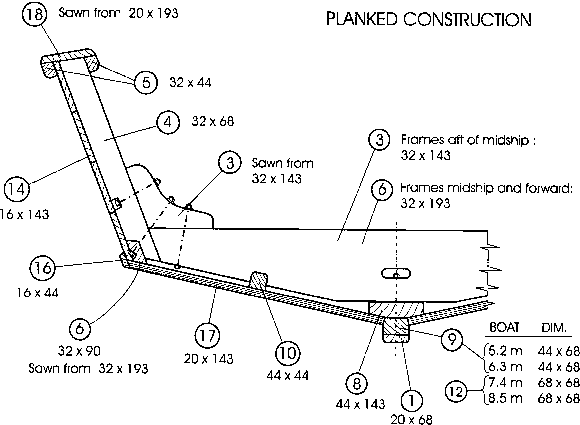 Below is given a list of sawn timber required for the various planked boots, Timber for the buiding jig is given on page 25. The quantity includes a wastage factor of 25 %. The wastage factor could be lower or higher dependent on the quality and the length of timber available. Longer lengths of timber gives less wastage. 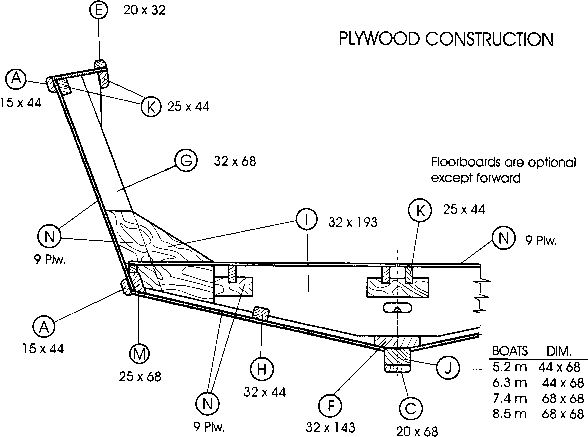 However an advantage of the cross-planked bottom is the utilization of short lengths of timber. Proper stacking of timber is important. After sawing, the timber must be stored under a roof protected against sun and rain. The drying time depends on the season. During the dry season a 25 mm plank will dry in 3 months, but it will take 9 months during the rainy season. 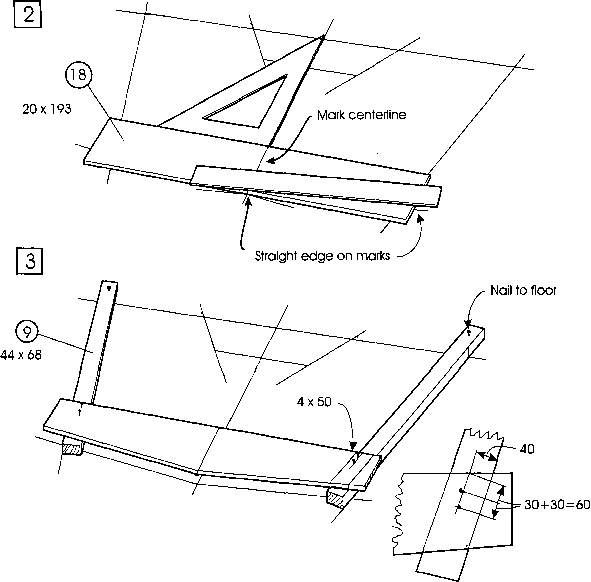 How to sketch wooden boat frame? How to mark boat frames from full size plans?